These are the days where weddings are becoming more personalized and very unique to each couple. Adding some DIY crafts to your Wedding can help you achieve this look. They are a little time consuming, but the pay off is huge when you walk into say, your reception with 800 cranes hanging around you (We went a little paper crane crazy). 2. All of the heart punch-outs we had from the Book Page Banners, we used for our cup cake toppers! Just take a tooth pic and glue a heart to either side, easy as that. Because we had so many cut outs, we sprinkled them on the tables as well, helping tie all the decorations together. 3. 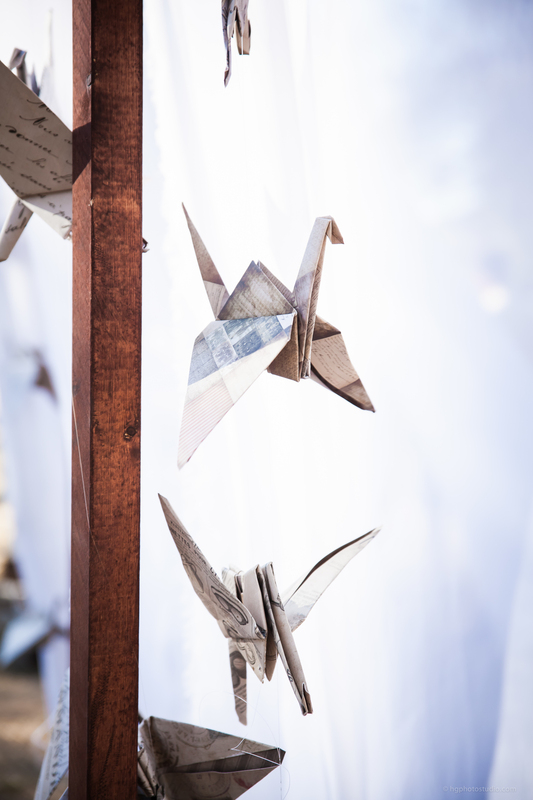 Paper Cranes. Oh those paper cranes. This is what we spent most of our time on. We bought giant square (you'll need square!) paper at Michaels, all different rustic looking colors, and fishing wire to hang them on. You can find how to fold them into cranes from YouTube. I recommend working on this a little bit at a time, through out the entire time you are engaged. That way you don't go crazy from folding and you give your fingers a break! We cut a small hole on the bottom and top of each crane, because the fishing line is so slippery, at the top of each crane we would tie the line in a knot, securing it in it's place. All these were really cheap and easy to make, a little time consuming, but with all the complements we got and how wonderful our wedding looked, it was all totally worth it!